Next time, Sachin, next time. One of the curiosities of Test cricket (at least to fans of baseball) is the fact that a game of cricket can go on for five days and still end in a situation where no team is declared a winner: in cricketing parlance, a draw. Another of those curiosities is that, in fact, cricket possesses several kinds of draws. The first is the dullest: it’s where one team amasses a huge amount of runs in the first innings and the opposing team does the same, and it takes such a long time that neither team has any time left in the match to win. Unfortunately, Test cricket has good proportion of these games—usually because the pitch is so placid and easy-paced that the bowlers don’t stand a chance and the batsmen can accumulate runs to their heart’s content. The second type of draw is the rearguard action. One team dominates the other, and the excitement (or frustration) exists in seeing if the weaker side can resist the pressure and not lose any more wickets. In such situations, the satisfactions of the draw can be as great as if your team won. When England played Australia in the first Test match in 2009 and managed to resist Australia with a heroic last-wicket stand, the English were so energized by the draw that they went on to win the next Test match, and thence the series. The third type of draw is where both teams could win or lose right until the last moment. This happened in the recently concluded third Test match between West Indies and India in Mumbai. As in the first type of draw, the West Indies and India had racked up big scores in their first innings (590 and 482 respectively). By the end of the fourth day, West Indies were 81 for 2 wickets in their second innings, and everyone assumed the game would peter out. The press and crowd, who’d turned up in large numbers to see Sachin Tendulkar hit his hundredth international hundred and who’d stuck around in the hope that something might happen by way of a cameo from Virender Sehwag or M. S. Dhoni, gave a collective yawn. Then, as is the way with Test cricket, the very, very improbable occurred. Having been an extremely comfortable 199 runs ahead going into the final day, the West Indies team collapsed to 134 all out in their second innings, leaving the Indians with 64 overs to get 243 to win. Very do-able. The Indians went for it, but suddenly batting—which had been so easy that no fewer than eleven West Indies and Indian batsmen had scored half-centuries or higher in their first innings—became very tricky. Nonetheless, relentlessly India closed in on victory, only for the side to lose wickets at crucial moments. In the end—after all of the relentless accumulation of runs and Sachin’s 94, the whole game came down to six balls remaining, with the Indians needing two runs to win and the West Indies requiring two wickets to do the same. The Indians, however, only managed one run; the West Indies one wicket. The result was a draw—but it was only the second draw in Test cricket where the teams had exactly the same score: in this case, 241. So, out of the humdrum, an epic contest had formed. Dhoni, the Indian captain, told a packed press conference that he’d wished the previous four days could have been as exciting as the last. But, in my (Martin’s) judgment, it’s precisely because the first four days gave no inkling of the manic closing moments that made the day so gripping. Sometimes our deferred pleasures are that much sweeter because they are a long time in coming—and give no idea that they ever would! 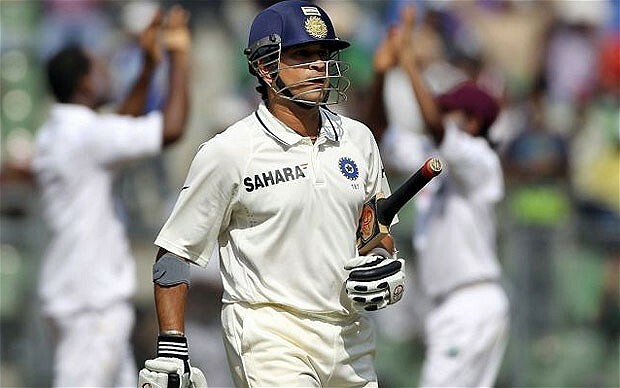 This entry was posted in Cricket, India, Right Off the Bat Website, Test Cricket, West Indies and tagged Mahendra Singh Dhoni, Sachin Tendulkar, Virender Sehwag. Bookmark the permalink.